Immersion experiences in another country, another culture, can bring out the best—and the worst—in people. While living abroad you cannot help but make moment-by-moment comparisons between where you find yourself and where you call home. Seemingly little things: if they drive on the left instead of the right as they do at home, which side of the sidewalk should you walk on? (Answer, at least here in the UK: there are no sidewalk etiquette rules. Expect complete chaos.) To deeper comparisons such as “Why are all British nurses forced into one of four possible specialties (Adult, Pediatrics, Mental Health, and Learning Disabilities) from the very beginning of their education?” Is this Florence Nightingale’s legacy? As a cheeky American nurse (and nurse educator) living and working in the UK, this British approach to nurse education is something I sincerely hope that American nursing never tries to adopt. There is much to admire about the UK healthcare system, with the prime example being the existence of the NHS—although imperfect, as are all healthcare systems, it is much loved and functions so much better than the US healthcare ‘system.’ It occurs to me as ironic that while the US healthcare system is more fractured than the British NHS, British nurse education is more fractured than is ours in the US. Or at least that is how it appears to me. This British nursing forced specialization practice is a holdover from the days (not so long ago here) of hospital-based apprenticeship, diploma-level nursing. Of course, in the US, we have also had this form of nurse “training” that is fast being phased out. In the UK, there continue to be debates about the value of a higher education degree for nurses, with some people arguing that university degrees are responsible for the apparent diminishment of empathy among British nurses. Empathy cannot be taught, but it certainly can be encouraged and modeled. I do wonder: how well can that happen in any nurse education model based primarily on traditional lectures with a class size of upwards of 700 (or more) students and multiple cohort intakes and graduations each year? That is the current reality of nurse education in the UK. Mass marketing of (or attempts to teach) empathy not only do not work—they have the opposite effect. Although I am currently situated at a UK School of Nursing, I first learned about the strange (to me) structure of British nursing from two non-fiction/memoir books: 1) The Language of Kindness: A Nurse’s Story, by Christie Watson (London: Chatto and Windus, 2018 and 2) One Pair of Feet, by Monica Dickens (yes, related to ‘that’ Dickens), (Middlesex: Penguin, 1946). Monica Dickens’ book is based on her brief stint as a hospital nurse apprentice during WWII. Christie Watson’s book is based on her twenty years’ work as a pediatric nurse in London hospitals. I highly recommend Watson’s book, but not the one by Dickens unless you are a WWII buff of some sort. (…) It was the red sneakers Essie was wearing that drew me to her at the women’s shelter earlier that day. This was the second time in the past several months I had run into Essie at one of our foot care clinics. She wore an orange polyester shirt with a green chiffon scarf tied around her dreadlocks, a pink pleated skirt down to her ankles, and the red sneakers. She told me she only dressed in bright, Caribbean colors: “They keep me happy. I can’t be all down in the dumps when I got these colors on.” Essie had a perpetual and slightly crooked smile, the crookedness perhaps the residue of a stroke. The women’s shelter is located in a church basement in downtown Seattle near the main shopping district. It is a day shelter, a safe zone for women and children, that serves homeless and marginalized “near homeless” women, especially women dealing with domestic violence. The shelter has multiple case managers, social workers, and volunteer nurses who try to connect women with health, housing, and social services. The shelter workers lend the women a hand, bend an ear to hear their problems, offer a leg up the socioeconomic ladder, a toehold on life. Empathy is their main tool. Empathy is what we try to cultivate in our health science students. Empathy is “feeling with” as opposed to “feeling for,” which happens at arm’s length sympathy. “Walking in another person’s shoes” is how empathy is most commonly described. But can we ever walk in another person’s shoes? And is it always a good thing to try? * quote is from Joan Didion, The Year of Magical Thinking (New York: Vintage International, 2006), p. 37. 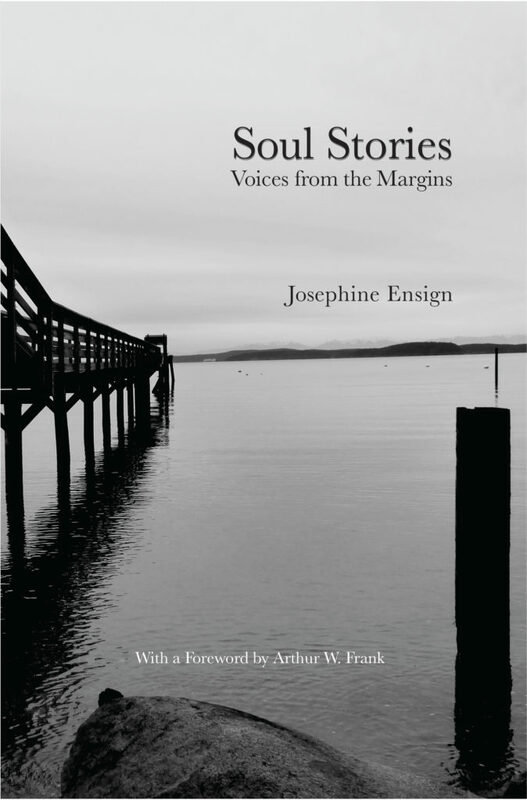 Note: The above excerpts are from my essay, “Walk in My Shoes” in my book Soul Stories: Voices from the Margins (San Fransisco: University of California Medical Humanities Press), pages 11-12. Empathy is in short supply. Anti-empathy, racism, xenophobia, misogyny and all things ugly are being modeled and stoked by too many people and institutions—including, of course, the President of the United States. Effective resistance to all of this comes in many forms. It is not enough and is self-indulgent to be simply outraged. Fire and fury is not the answer. Do something: Read like you give a d@#n.
You do not need to read or re-read Ray Bradbury’s dystopian novel Fahrenheit 451, or review the history of book-burning, book-banning, author suppression and outright killing (as by Hitler during WWII), to know that books and the mind (and empathy) expanding knowledge they contain is powerful stuff indeed. My beloved local library system, Seattle Public Library (SPL), has a gutsy and well-read patron who posted “Sh**hole Countries: A Reading List” on their BiblioCommons site. The SPL has added a disclaimer that the post and the list of recommended books is not a publication of the SPL, but kudos to them for supporting the sharing of diverse opinions and resources. Even if you happen to find the content of the brief post either too in-your-face or borderline offensive, be sure to look at (and hopefully read) some of the amazing books on the recommended reading list. Of course, reading real literature (non-fiction, fiction, poetry, plays) does not necessarily build empathy and equity. Mind and heart expansion require having at least a doorway or a window or a crack in the walls of mind and heart for them to open and expand. But good books and reading them like you give a d@#n do have amazing, lovely, powerful, radical effects on not just the individual reader but also the world. For the past three summers I have posted a summer reading challenge list of books that have a social justice, global, and health humanities bent. (See “Summer Reading Challenge with a Health Humanities/Social Justice Slant” from June 2, 2015; “Summer Reading Challenge 2016” from May 28, 2016, and; “Summer Reading Challenge: Global to Local” from June 11, 2017.) You don’t need to wait until the summer or a vacation of some sort to start reading real books, radical books, world-view changing books. What poetry does: inspires, transforms, moves, agitates, articulates, imagines, disturbs, delights, and mystifies. Poetry happens. All around us. Every day. Even if we aren’t fully aware of the fact, the muses are whispering subliminal sweet everythings in our ears. Poetry needlessly intimidates; poetry is relegated to the shelf labeled ‘inaccessible.’ At least that is the case for most adults; children seem to be born poets and we educate them out of it. Goodnight Moon, along with most other popular children’s books, are really illustrated poems. Along with Cicero so long ago, pragmatic people proclaim that poetry and art are dead. Not true. I love poetry and have been a mostly closeted writer of poetry. My first (and so far, my only) published poem at age nine (in my elementary school newspaper) was a haiku: “A hurt cricket limps/helplessly and hopelessly/into the forest.” At the time, I wanted to be an entomologist, or a veterinarian, or a writer. I most definitely did not want to be a nurse, but when I re-read this haiku, I see the empathy and compassion that later led me to nursing. Several years ago when my mother was dying of cancer and in home hospice, I found that I could only read poetry. Poetry has a magical quality. I use poetry in my teaching. For nursing students, I’ve found that it helps to use a healthy dose of poems written by nurses. They resonate more closely for the students, and also make poetry less frightening to students who equate poetry with totally inaccessible, frustrating writing. For instance, I often use the powerful poem by Cortney Davis, “I Want to Work in a Hospital” “where it’s okay/to climb in bed with patients/and hold them—” to spark a discussion on empathy and the murky realms of professional boundaries and burnout. I love the moment in class when I read that opening line, hear a dampening of background noise, and look out over the sea of faces suddenly fully attentive. Poetry is magic. I use poetry writing in my teaching, but I often sneak this in by not announcing it as poetry writing. For many years, in my health policy undergraduate course, I had students write an American Sentence of their take-home message for that class session. (See my previous blog post “Nurses and Writing the American–Healthcare–Sentence.”) An American Sentence is an ‘Americanized’ version of haiku and is a sentence consisting of 17 syllables. With a class of 150 students, this assignment did double or triple duty: it reinforced their in-class learning of concepts; it forced them to focus and hone their writing skills, and it helped me to read all of their writing before the next class session. Here are a few of my favorite student American Sentences about health policy: “US healthcare: purposeful opacity in service to the rich.” and “Sticks and stones will break our bones, but prevention is the way to stop it #nopoetryskills.” OK, so obviously the student who wrote that last one had figured out the poetry part. Good use of humor and Twitter. I continue to search for ways to sneak more poetry into not only my teaching, but also into my writing life and into my life. The photograph here is from the Te Papa Museum, New Zealand’s amazingly wonderful national museum in Wellington. 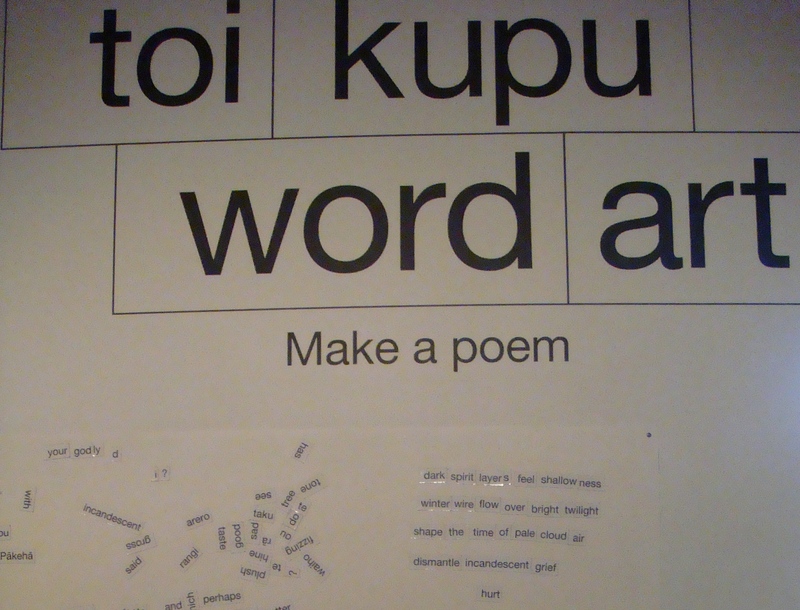 They had a ‘make a poem’ board with those little magnetized words in both Maroi and English that adults and children could play with and change around into ephemeral poetry: word art (or toi kupu, which I think literally translates to ‘speak art’–lovely!). When I was there this past February I stopped and wrote a poem mixing English and Maori words, using the Maori words by instinct since I don’t know more than a few words of Maori. Here’s what I came up with (translated into English, and I suppose this counts as my second published poem. Move over hurt cricket!) Poetry happens; let it happen to you.